One of the largest residential developments ever proposed in Goochland County was decided Tuesday night, more than a year after the project was first introduced. HHHunt’s plan calls for 341 single-family detached homes and 179 townhomes that would be restricted to owners aged 55 and older. 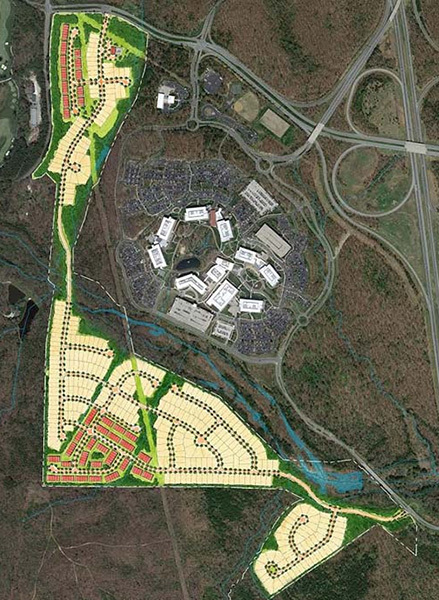 The development would stretch from Tuckahoe Creek Parkway northwest of the Capital One campus, wrap around it to the south and cross Broad Branch creek, and connect with Broad Branch Drive just west of Route 288. Called “Mosaic at West Creek,” the 207-acre development would be the largest subdivision in Goochland, as well as the first to include townhomes, according to county staff. It would also include the smallest lot sizes in the county, with 55- and 65-foot-wide lots for single-family homes about 2,000 square feet in size. 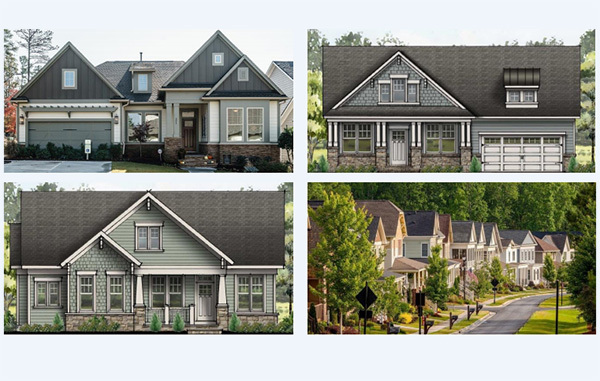 All 520 homes would have first-floor master bedrooms, no vinyl siding, maintenance provided by a homeowners association, sodded and irrigated yards, landscaping and street trees. The townhomes, representing about 40 percent of the total units, would be built in the northeast and southeast corners of the development. Prices for the single-family homes would range from $350,000 to $500,000 and up, while the townhomes would range from $280,000 to $350,000 and up. Amenities would include a pool, 5,000-square-foot clubhouse, fitness center, sidewalks and trails. Buildout would take about eight years to complete, with an average of 65 homes built per year. HHHunt proposed the project just over a year ago and held three community meetings, in February, June and August. The planning commission didn’t vote on the project until November, when, absent one member, it split on a 2-2 vote on whether to recommend approval to supervisors, causing a motion to do so to fail. Supervisors heard the rezoning request in December but deferred a decision to this month. A contributing factor to the duration of the case was a change in the county’s cash proffer policy, which was revised last month to reflect changes in state law restricting how localities can accept the one-time payments from developers meant to offset impacts on public infrastructure. Chesterfield County has likewise adjusted its policy as a result of the legislation. As a result of that process, HHHunt increased its total proffer amount for the project from nearly $857,000 ($1,648 per home) to upwards of $2.5 million ($4,937 per home) to cover impacts to roads, parks and public safety services. The earlier proffer amount had not included proffers for roads, as HHHunt had contended the development would generate less traffic than the office-industrial use allowed by existing zoning. The proffers do not account for impacts to schools since the development would be restricted to ages 55 and up, with an added restriction of no residents younger than 19 allowed to reside in a home. Kim Kacani, president of HHHunt Communities, told the board that the company has a waiting list approaching 100 people interested in the community. HHHunt worked on the project with traffic engineering firm Green Light Solutions, land planning firm Cite Design and civil engineer Youngblood, Tyler & Associates. Preston Lloyd with Williams Mullen represented HHHunt in the zoning application process. The development adds to other residential projects approved or under review in the West Creek area. To the south along Route 288, Tennesse-based Bristol Development Group is wrapping up a 373-unit apartment complex at the West Creek Parkway interchange. Farther south, at the Patterson Avenue interchange, The Pruitt Cos., which owns and operates the business park with Bill Goodwin’s Riverstone Group, has received approval for its proposed mixed-use development at the former Oak Hill Golf Course. Meanwhile, along Hockett Road to the north, Eagle Construction of VA has proposed more than 300 homes on about 153 acres. A rezoning for that project was deferred in December and is scheduled to be heard at the board’s April 17 meeting. 7 Comments on "Goochland greenlights 500-plus homes near Capital One"
Its a good move for them to do this for age restricted housing. The cash proffer seems excessive in light of the services provided but the developer has agreed to them, so be it. West Creek is fast becoming a place to live and work. How about play? More just curious, but how is such age discrimination in housing legal? I’m not a lawyer, just curious if you know how this is governed. If one were to say you didn’t want old people (age restricted to age 25 and under), I have a feeling that would not be legal. If you said you wanted say “whites only” then that would not be legal. Why is it legal to limit housing in this way? Thanks. Because older people were typically the ones being discriminated against the housing laws were adjusted to allow limitations in favor of older ages. Maybe it was part of the Fair Housing Act (I forget). From other news sources it seams only the townhomes will be age-restricted; is that correct or is it the entire development? Either way you are looking at the begins of the new Short Pump. What Broad Street west of I-64 to 288 was when I was in high school 25 years ago is where Goochland is now. By 2040, 288 to Mankin Road will be the new Short Pump. Broad Street through Centerville/Rockville VA in Goochland will resemble Montgomery Turnpike in Rockville Maryland. Agreed. Goochland is following in Henrico’s over-development footsteps.